Splendeurs de Nuit specializes in exterior ambiant lighting. 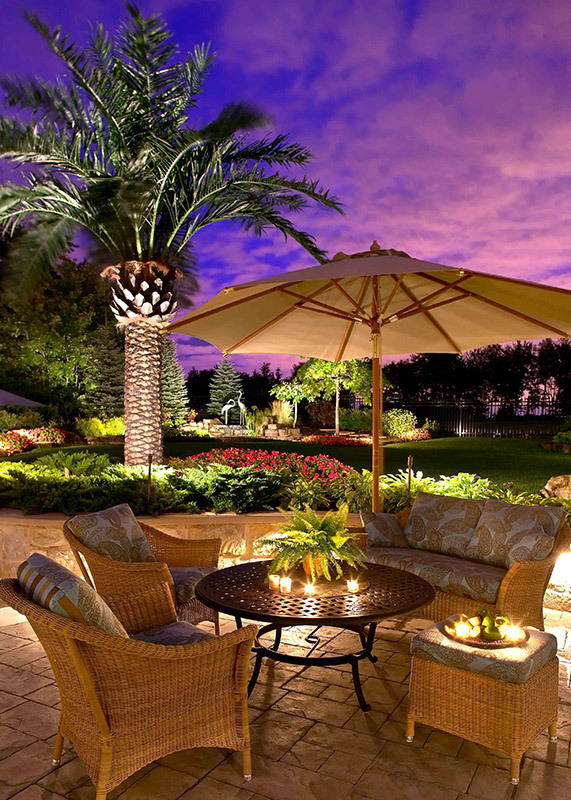 Whether it is to highlight the nicest elements of your landscaping with artistic landscape lighting, or to bring out the beauty of your residence through architectural lighting, we know how to take full advantage of light’s enhancing power, in order to create a warm and inviting atmosphere in the same environment which makes you proud in the daytime. What good is owning a piece of paradise if it disappears at nightfall? Splendeurs de Nuit knows how to customize and adapt the softness of the exterior lighting according to your preferences and intentions, while taking your budget into account. We know how to bring out the beauty and unique character of your property by spotting the artistic potential of the elements which make up your exterior decor. With over 30 years of experience in lighting, we create remarkably beautiful light decors. Our strength is knowing how to use light to create an atmosphere and to display the beauty of your property by judiciously choosing where to install the fixtures while keeping the focus on what is lit, not the fixtures. The high quality standards with which we work, guarantees your highest satisfaction. In fact, we consider your satisfaction an obligation. Whether for your city garden our your country property, the right lighting makes all the difference and completely changes the way you can enjoy your surroundings. It will not only enhance your landscaping, but also your property value! Create your desired outdoor decor with a Splendeurs de Nuit original landscape lighting for an unforgettable atmosphere! © 2019 Splendeurs de Nuit All Rights Reserved.